Fashionable, durable, and easy to use soft straps. 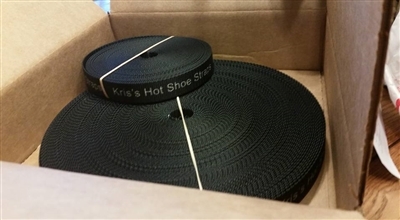 Heavy duty stitched Nylon webbing thickness is .07 to .075 of an inch with a breaking strength of 1400 to 5500 pounds. It has a melting point of 350 degrees and over 20 colors to choose from. Say good bye to the scratches of the tie downs on the handle bars and extend your tie down a little further.